Children with mixed abilities at the San Miguel Primary Education Resource Centre and the Marsascala Primary School interacted with each other and responded well to the sounds produced during the Valletta 2018 Earth Garden Happy Jam. 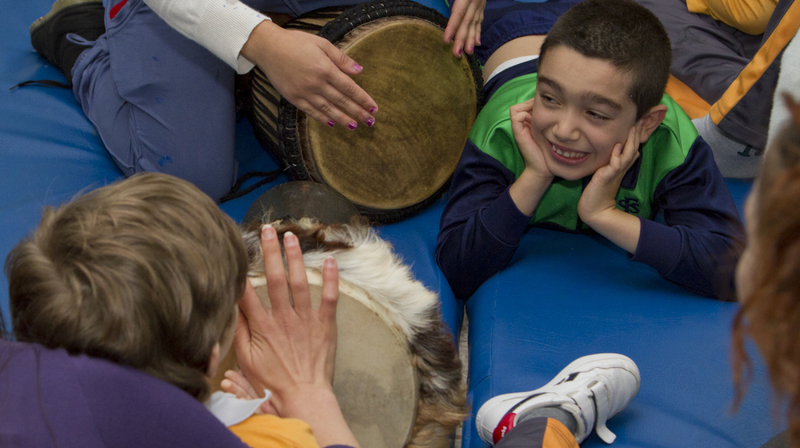 Music is proven to promote wellness among children with mixed abilities. Some 60 children from the San Miguel Primary Education Resource Centre and the Marsascala Primary School this morning participated in three percussion workshops with Tribali’s Peter Paul Galea, organised by the Valletta 2018 Foundation as part of the ŻiguŻajg Festival for Children and Young People. The children with mixed abilities, interacted with each other and responded well to the sounds produced. They found the sessions extremely fun and relaxing while they were led through the steps of drumming, beating and shaking to learn the basics of rhythm and beat. The sessions took place at the San Miguel Primary Education Resource Centre, Pembroke. Music is proven to promote wellness among children with mixed abilities and especially children diagnosed with autism spectrum disorders, improving social behaviour while increasing focus and attention and communication attempts. It is also known to improve body awareness and coordination. ŻiguŻajg Arts Festival is organised by the St James Cavalier Centre for Creativity.